My Wine of the Month for September is Beyerskloof Reserve 2006. 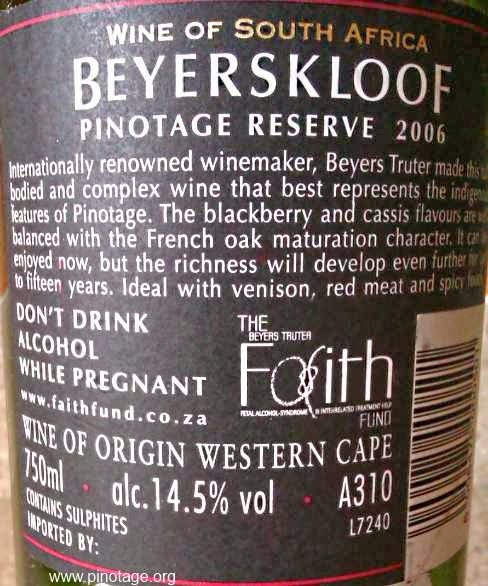 After a week in Alsace where pale thin Pinot Noir is served very cold I longed for the body, flavour and warmth of a decent Pinotage, and what is more reliable than Beyerskloof? I’d intended keeping this longer, the back label suggest up to 15 years, but it is drinking beautifully now. Youthful exuberance has given way to a more precise sleekness and tastes of red plums with a trace of dark chocolate on the finish. Suddenly we were looking at an empty bottle. Delicious. 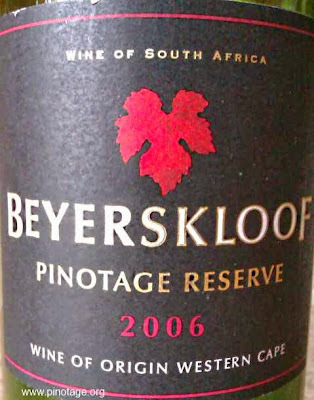 Beyerskloof Reserve 2006 was a Top 10 Winner in 2008. This year, exceptionally, five winners were chosen instead of the usual three. The winning winemakers will enjoy a foreign trip as their prize. KWV Abraham Perold Tributum also won last year, the only wine to win the competition twice. Anura will be double celebrating because their varietal Pinotage was a Top 10 winner this year. 45 wines from 35 producers were entered. Viljoensdrift: Pinotage (30%), Merlot (44%), Shiraz (24%), Cabernet Sauvignon (2%). Interesting to see that Shiraz is a component in every winner. Shiraz seems to complement Pinotage. I recall Warwick Estate added Shiraz to their Three Cape Ladies blend years ago, and I remember Guy Webster of Stellenzicht telling me his 50/50 Pinotage/Shiraz blend being the best wine he'd made. I received more emails about my April WOTM Houdamond Pinotage 2009 than any other single brand, most asking where it could be purchased as their local store didn't have it. Houdamond is Bellevue Estate's 'Morkel' Pinotage with an exclusive label for Marks & Spencer and the 2009 sold out fast. Now Houdamond has returned. I saw the 2010 vintage in my local M&S today. The M &S website also has it - although the website says it is the 2012 vintage which I think is unlikely and probably a mistake. If you want it, dive in while you can. I’ve been drinking quite a bit of Delheim’s standard Pinotage 2010 which is currently stocked by The Wine Society. So it was a pleasure to meet Delheim’s new winemaker, Reg Holder, for the first time at the Beautiful South wine fair in London last month and I asked Reg to tell me about the 2011 vintage that he was pouring. I chose Delheim’s Barrel Selection 2007 for my July Wine ofthe Month. Reg told me that Barrel Selection – which used only to be available from the winery – is no more and that the equivalent Pinotage is now under the Vera Cruz label. 2013 Pinotage Top 10 winner ‘Back Road’ 2012 Pinotage comes from a winery, Black Elephant Vintners, that I’d not previously heard of. Not surprising since it only came into being in January 2013, founded by Franschhoek based financiers Kevin Swart and Raymond Ndlovu. It’s a tremendous achievement for a brand new winery to leap into Pinotage stardom with their maiden vintage, but they do have the benefit of a winemaker with form. Winemaker/viticulturist is Jacques Wentzel, whom I met when he was cellar-master at Schalk Burger’s Welbedacht winery. While there Jacques crafted their 2009 Meerkat Pinotage which was a Top 10 winner in 2011. Hand-picked grapes for The Back Roads Pinotage 2012 came from a single vineyard of old vine Pinotage growing in “Die Perskoen” ward of Wellington. Uncrushed grapes with 15% whole bunches fermented spontaneously and aged for 15 months in used (5 - 8 year old) French oak barrels. Full details of the winemaking process and technical information is on the website www.bevintners.co.za which went live this week. I look forward to tasting Black Elephant’s wines in the future, and congratulations again to Jacques and the Black Elephant team. Back Road comes from a winery I've not previously encountered (or even heard of), Black Elephant Vintners in Franschhoek. The Pinotage Association says: Pinotage stalwarts L’Avenir in Stellenbosch and Tulbagh’s Rijk’s Private Cellar joined relative newcomers including Black Elephant Vintners from Franschhoek in the winning line-up for this year’s Absa Top 10 Pinotage Competition. This year’s Absa Top 10 Trophy winners underscored the belief that excellent soils and climatic conditions for Pinotage are found throughout the Cape winelands. Besides L’Avenir, Stellenbosch produced winners in Lyngrove Wines’ Lyngrove Platinum Pinotage 2012, while Manley Pinotage 2011 from Manley Private Cellar also got the nod for Tulbagh. Franschhoek is represented by The Back Roads Pinotage 2012 from Black Elephant Vintners, with the Anura Pinotage Reserve 2011 sealing the Paarl slot. Closer to the coast there is Springfontein Jonathan Ridge Pinotage 2010 from Stanford and Wildekrans Pinotage 2011 in the Botrivier area. Robertson’s Rooiberg Winery also takes a Top 10 with its Rooiberg Winery Pinotage Reserve 2012 and the Diemersdal Pinotage 2012 ensures that one of South Africa’s oldest wine-making areas, namely Durbanville, also makes the list of this year’s winners. This year’s Absa Top 10 Pinotage Competition attracted 126 entries. L’Avenir and Rijk’s Private Cellar cemented their status as two Pinotage wine icons by winning their eighth Absa Top 10 Pinotage Trophy. Since its launch in 1997 the Absa Top 10 Pinotage Competition has become South Africa’s leading showcase for the country’s own grape variety, and according to Beyers Truter, chairman of the Pinotage Association, for any cellar to win eight Absa Top 10 Trophies in 16 years is a monumental achievement. L’Avenir won Top 10 Trophies in 1997, 1998, 2000, 2001, 2002, 2003 and 2004. Rijk’s Private Cellar in Tulbagh produced Trophy winners in 2001, 2003, 2004, 2008, 2010, 2011 and 2012 before reaching the magic number eight at this year’s Top 10 awards. The two cellars’ winning wines were the L’Avenir Pinotage 2011 and Rijk’s Reserve Pinotage 2009. "For 17 years now, Absa has been the driving force behind the Top 10 Pinotage competition, enticing wine makers every year to aim for one of the prestigious trophies. Our partnership with this competition reflects our long-standing commitment not only to the Pinotage Association but to the SA wine industry in general. This competition encourages the growth of this vibrant sector which has an enormous contribution to make in the economic landscape of our country," says Brienne van der Walt, Managing Executive: Absa AgriBusiness. Internationally-respected sommelier, restaurateur and author Guido Francque is one of the wine world’s most ardent admirers of South Africa’s Pinotage grape variety, and the Belgian says the quality of Pinotage wines are showing vast improvements as wine-makers and viticulturalists put their fingerprint on the cultivar. Francque said the 126 entries from 80 producers was the most impressive line-up he had experienced in his years of judging the Top 10. 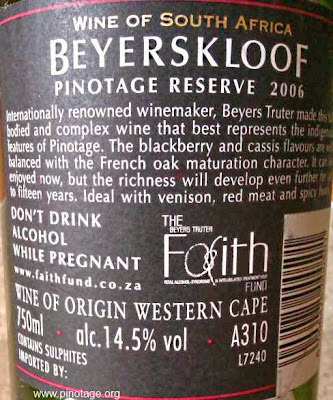 “I have been following Pinotage for over 20 years now, so have seen pretty much all that the South African wine-makers have employed in making your country’s signature wine variety in terms of extraction, wood-maturation and levels of ripeness,” says Francque. This year’s judging for the Absa Top 10 took place at Nederburg. On the panel with Francque were: Duimpie Bayly, Chairman, Neil Pendock, Winnie Bowman, Chris Roux, Frans Smit and Debbie Thompson.